My wife and I saw Cars 2 in the theater, and considering all the negative reviews we heard about it we really were not expecting much... and I think that actually helped us to enjoy it more, because we didn't find it all that bad. 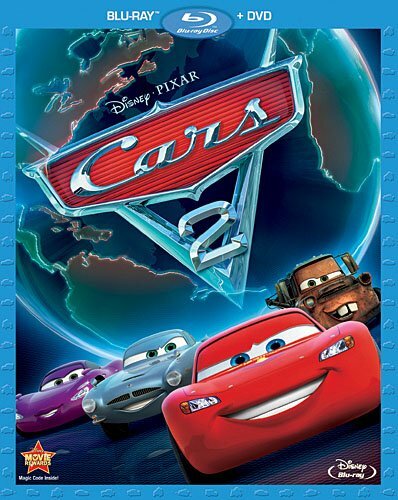 Was it as good as the original Cars? Definitely not, though the original Cars really isn't one of our favorite Pixar movies anyway. Cars 2 lacks the emotional punch, and the life lesson it tries to convey seems kind of hacked in there. Basically, it's just a goofy movie with some funny fish-out-of-water moments but without a whole lot of substance. Mater, voiced by Larry the Cable Guy, is a country hick tow truck that travels to Japan with his best friend, race car Lighting McQueen, to assist him in a race competition to demonstrate a new clean fuel. So once in Japan, Mater acts like his usual self and thus slightly embarrasses McQueen. Somehow or another, Mater winds up accidentally involved with a couple of British spies who think he is actually an undercover American agent posing as an idiot tow truck. The conflict between Mater and McQueen really starts when McQueen is in the middle of the first race and is in the lead and all of a sudden he pulls to the outside allowing his rival to overtake him. He does this because he hears Mater saying "Outside" through his headset, but what he doesn't know is that Mater is responding to one of the British secret agents who is talking through Mater's headset. This scene just doesn't feel natural, it feels like the filmmakers are trying to force a conflict. McQueen is a race car, and he knows how to race. He has won several championships and he did so without Mater ever being on his crew. McQueen didn't even really bring Mater along to help with the race, he brought him along because they're best friends and Mater had never been out of his home town of Radiator Springs. So why would he follow a single command from Mater that McQueen didn't instinctively feel was right, at least without first confirming why Mater wanted him to move to the outside. And then when he loses he gets mad and blames Mater, but he's the one who listened to supposed advice from someone who had no experience in racing. That scene and their separation just didn't feel right, and thus didn't really have much of an emotional impact. Then later toward the end of the movie when McQueen appologizes, he says that he was wrong and that Mater shouldn't have to change to fit in and should always just be himself, which is nice, but also doesn't quite feel right. First, because the initial argument wasn't sparked by Mater not fitting in, and then also because yes, sometimes you should change how you act based on where you are. You should try to be respectful of the culture you're in and not oblivious to everyone but yourself. The extra features on the DVD consist of a commentary and two animated featurettes. The first is called Hawaiian Vacation and is a cute little Toy Story stay-at-home adventure where they help Ken and Barbie experience a Hawaiian vacation. The second one is called Air Mater and involves Mater from Cars getting wings and a propeller put on and learning how to fly. Both shorts clock in somewhere between five and six minutes. There may be additional features on the Blu-ray disc, but there weren't any others listed on the back of the box and since I don't have a Blu-ray player I can't exactly pop it in and find out.